Even as death toll of the homeless due to severe cold reaches 44 in the national capital, Delhi Chief Minister Arvind Kejriwal has washed hands of all the responsibility and pinned the blame on Lieutenant Governor (LG) Anil Baijal for ‘appointing a useless officer’. This statement of Kejriwal comes hours after their Rajya Sabha nominee Sanjay Singh shrugged off the responsibilities by indulging in whataboutery and making outrageous remark that people are dying in Jharkhand as well. Shockingly, while Kejriwal tried to pass the buck on to DUSIB (Delhi Urban Shelter Improvement Board) CEO, he forgot that he himself is the Chairperson of the Board as Chief Minister. 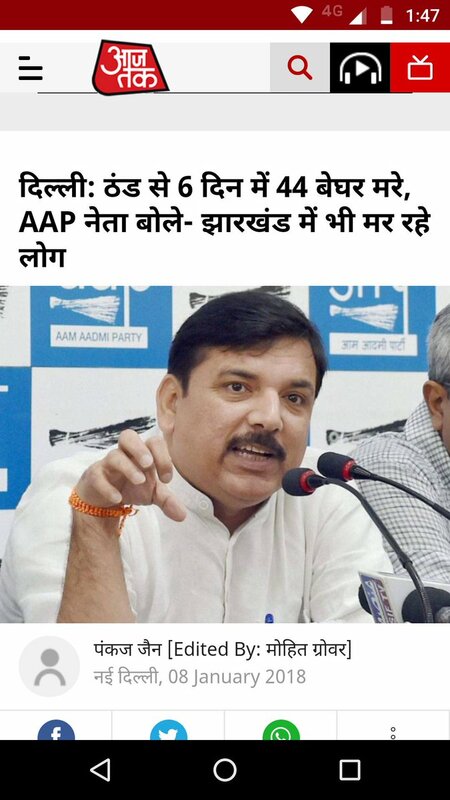 44 lives lost to poor infra, lack of shelter homes in Delhi in just SIX DAYS despite increasing the budget by 9 crores. Shouldn’t Kejriwal, the CHAIRMAN of the shelter improvement board, instead of blaming the LG and officers take the moral responsibility and resign? Soon, Twitter users slammed Kejriwal for indulging in playing politics over deaths of innocent. Dear @ArvindKejriwal , What happened to your World Famous Rain Basera in Delhi??? I see only @KapilMishra_IND & @TajinderBagga working on ground to provide shelter, warm clothes & blankets to poor people in Delhi. Delhi BJP spokesperson, Tajinder Bagga even requested Kejriwal to put politics aside to help save lives of the homeless in the bitter cold. 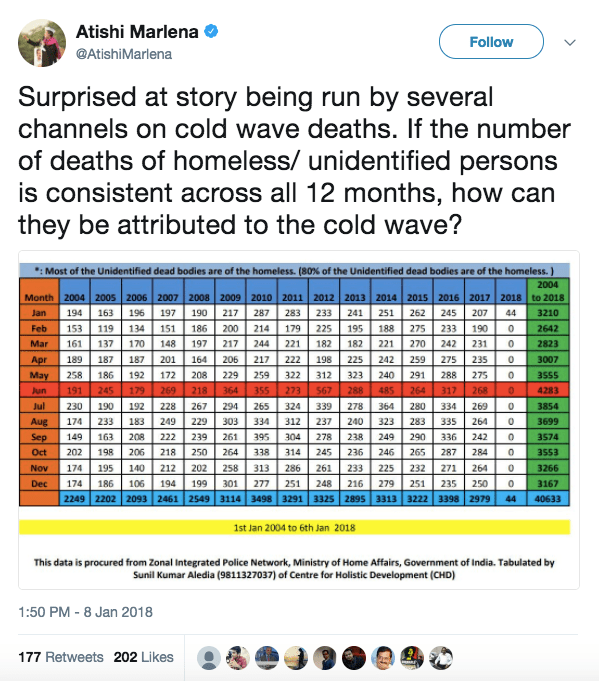 Meanwhile, AAP leader Atishi Marlena implied that the deaths of the homeless is not due to the cold. Politics aside, the coldheartedness of Aam Aadmi Party leaders in this bitter cold is shocking.